3 New Ships ... "The Safest Ships In The World," Salute the 25th ANNIVERSARY Of the Opening of THE PANAMA CANAL. Salute the Canal's 25th Anniversay! Walls, ceilings, floors - all structural parts of these three new sister ships for the Canal Zone are built of steel, making them the most fireproof ships in the world. Special subdivision of the hulls makes them virtually sinkproof. No other ships in the world can claim the new safety and beauty of Panama Line's three new sister ships - the SS PANAMA; the ANCON; and the CRISTOBAL.Life saving equipment is unique. Life boats are equipped not with the customary oars, but each (with the exception of one motorized life boat) has a propeller, manipulated by means of short; easily handled levers. Accommodations on these beautiful new ships are provided for 202 first-class passengers in 70 staterooms, each with a private bath or shower. On "A" deck, where most of the staterooms are located, they are grouped about eight verandas so that every room has a view of the sea. you will enjoy the luxurious appointments, the restful comfort of these delightful sea-view, sea-cooled rooms. Into the building of these new ships has entered an ingenuity that will baffle the most critical traveler. Not least among the many innovations for passenger comfort are the specially designed oil burners which prevent soot or oil dust from falling on the decks. Dining salons are air-conditioned and spacious, and the tiled swimming pools are out-of-doors in the sunshine. There are playrooms for children and the beautifully appointed lounges, the clubrooms and dining salons are equipped with loud speaker systems for both long and short wave receptions. World Broadcasting Company, as in the case of important American hotels, provides orchestral music for dinner, concerts, and dancing. In the main lounge first-run motion pictures are featured. you will have a good time on these ultra-modern luxurious new ships! Even a cursory visit, at sailing time, will show you how much they offer in the way of refined travel. 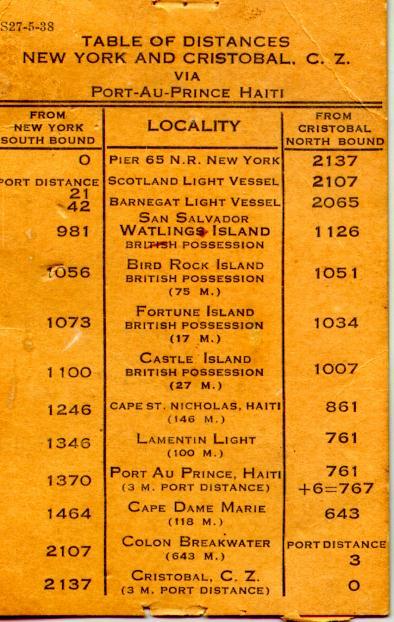 The PANAMA and the ANCON are already in regular weekly service between New York, Port-au-Prince, Haiti, and the Canal Zone. The CRISTOBAL sails on her maiden voyage August 17, 1939. These three new sister ships were designed by George Sharp, naval architect, and styled by Raymond Loewy, industrial engineer. They were built at Quincy, Massachusetts in the Fore River Plant of the Bethlehem Steel Company. They cost more than $4,000,000 each. They are 493 feet in length - 64 feet in beam. Top speed is 19 knots. They are three of the safest, most ultra-modern, smartly appointed ships in the world! In 1849 Panama Railroad Campany was incorporated under the laws of New York and given exclusive right to construct and operate a railroad across the Isthmus of Panama. The next year work on the railroad was begun. Five years later the last rail was laid, and the first locomotive run across the road on January 28, 1855. In 1881 the French Canal Company secured control of the company. In 1904 ownership of the railroad and all its rights and holdings passed into the hands of the U.S. Government as part of the purchase of the Panama Canal route. Today the company is operated by a Board of Directors appointed by the Secretary of War. Its President is the Governor of the Canal, Brigadier-General Clarence S. Ridley. The year the railroad was completed saw the first marine ventures of the company with ships operating between New York and Aspinwall - now Colon. 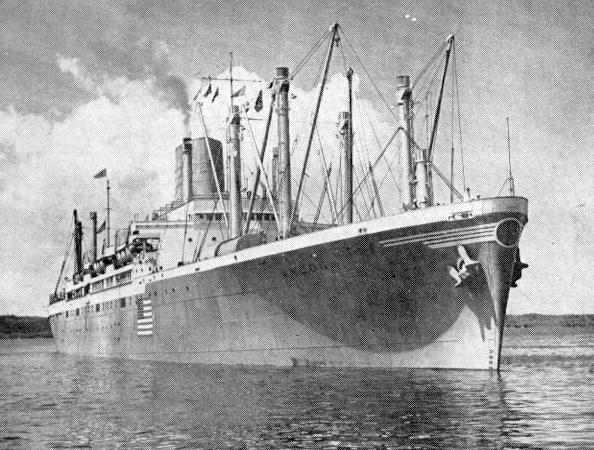 The next year service was increased with ships operating on the Pacific, between Panama and Central America. In February 1893 the present steamship service of the company was inaugurated between New York and the Canal Zone. In 1908 the steamers SHAWMUT and TREMONT were purchased by the Panama Canal from the Boston Towboat Company, were renamed ANCON and CRISTOBAL and placed in the company's service principally for the carriage of cement and other structural material for the Panama Canal. Upon completion of the Canal in 1914 the ANCON made the first official crossing. Later on the ANCON and the CRISTOBAL were rebuilt to accommodate passengers at a cost of approximately $2,000,000. Together with the BUENAVENTURA and the GUAYAQUIL, they have been in the company's regular weekly sevice between New York and the Canal Zone ever since. This month these four ships are being replaced by three new ships - three of the finest ships in the world. 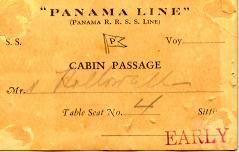 Which brings the Panama Line's record of progress in steamship service to August 1939. This month - the 25th anniversary of the opening of the Panama Canal - sees the company inaugurating regular weekly service, between New York and the Canal Zone, with three ultra-modern new sister ships - the PANAMA, the ANCON, and the CRISTOBAL.